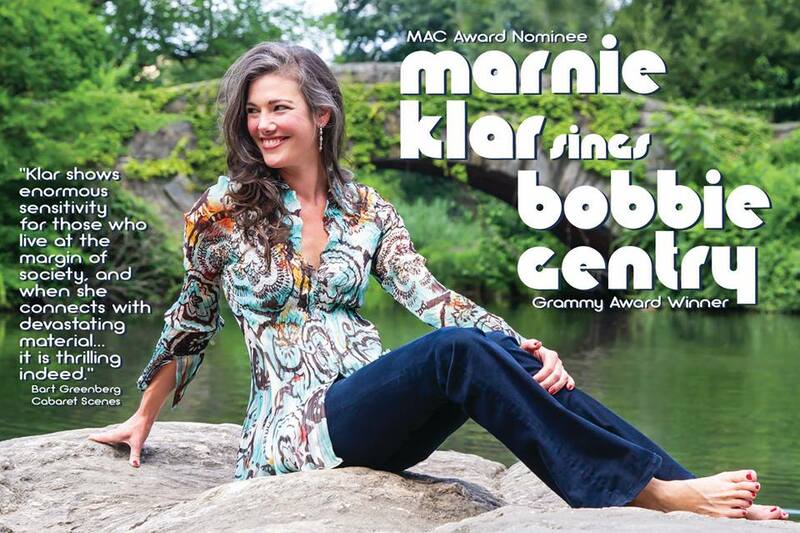 What can I say about “Marnie Klar Sings Bobbie Gentry”? Well, to start, it was an inspired pairing of voice and material. It was a well-researched show with minimal, informative patter delivered as a conversation and not a lecture. It was 20 songs in 1 hour that flew by like 20 minutes to me. It was a stupendous band (Steven Ray Watkins on Piano, Matt Scharfglass on Bass and Don Kelly on Drums) and fantastic arrangements. It was skillfully directed by Tanya Moberly. (See my mini-interview at the end of this Re-View.) It was many different textures in both feels (blues, jazz waltz, country, Latin, pop, small ballad…) and in vocal placement. Marnie has a great, rangy voice and she has got this “yummy” lower register that made this material perfect in her capable hands and voice. She is also incredibly gorgeous! Stunning! I am not a writer that likes to list songs because I sometimes feel that it ruins the fun of seeing what comes next if a reader decides to go to the show. In this case, there were so many stand outs, many tunes I had never heard before, that there were just too many of those moments to list! In a previous writing I mentioned that sometimes, if one is new or not proficient in presenting lesser known tunes that having a familiar tune placed here and there is helpful in moving the show along and allows an audience to take a breath with something familiar to then come back to having to listen more carefully again to songs they may not know. Not only did Marnie deliver many tunes I personally did not know, she made me feel like I should know them…like I did know them! She also, very smartly, interjected some very well-known tunes here and there so again, just a beautifully constructed show. The other thing that Marnie is really good at is making a well-known song just a little bit different with a new take or spin on the tune and sometimes, it’s literally with just a look at the end of the tune…just amazing! My only constructive complaint is that I wanted to get up and dance and then later on, I wanted to sing back-up vocals! Really, I have nothing but praise for this show and this delightful woman MARNIE KLAR! Please go to see her! I saw Marnie’s debut show back in 2011 I think and have watched both her and you Tanya, grow together into this force to be reckoned with! Tell me a little bit about of your process with a client. Do they come to you with the idea or music and a concept emerges or did Marnie come to you and say, “I want to do a show about Bobbie Gentry”? “They usually come to me with some kind of idea. Something about their life, something they care to express, or just straight up music…particular composers and/or styles. For me, it always, always, always starts with a list of songs. Ultimately, the songs fight it out and a show is born. Richard has a way of planting an idea and watching it grow, doesn’t he? Given Marnie’s incredible vocal quality, it was kind of a no-brainer. Who did the research? Marnie, you or both of you? Approximately, how long does it take from looking at the big list to the show? Aside from putting the show together and putting the patter where it fits, etc., do you also work with your people on lyric connection and patter delivery. Marnie was pretty flawless on this count. Tell me what you think makes you unique or different as a Director! Thank you for taking a few minutes to answer these questions. I think many of our readers who do not currently use a Director (and many should!) this may give them some insight as to the process. Congratulations to you all on this incredible show…it does take a village and Marnie has an incredible team!